I remember being a huge fan of both Tintin and Asterix when I was a kid, borrowing various titles from the local library and eagerly pouring over each and every page, but for some reason back then I never considered them comics. Comics to me featured either the superheroic likes of Spider-Man and Hulk or the weekly strips in the Beano and Dandy. Obviously the adventures of Tintin and Asterix were comics, but I guess the fact that they were (by and large) self-contained adventures and you could buy them from bookshops set them apart from the stuff you could pick up at the newsagent in those days. I never really put much thought to it then, and left both characters behind as my attention was increasingly drawn to the output of DC and Marvel. The announcement last year of a trilogy of Tintin movies to be directed by Steven Spielberg and Peter Jackson got me thinking about my childhood reading habits, prompting me to search through my parent’s attic, dig out some well-thumbed copies of various Asterix and Tintin books, and start making my way through them again. After all this time I found myself thoroughly engaged by both characters adventures: the Asterix books now seem slightly more pitched to a younger audience but they are more anarchic compared to the comparative sophistication of Tintin. This preamble isn’t intended to be about which I think is superior though - what I’m really getting at is my interest in them has been reignited and I fully intend to have two complete sets of books someday in the future (possibly for my son to thumb through when I deem him ready!). Which brings me (finally!) 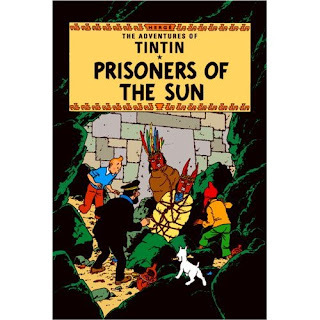 to my most recent purchases: a two-part Tintin adventure which runs through both The Seven Crystal Balls and Prisoners Of The Sun, originally published in 1948 and 1949 respectively. The plot involves members of an expedition to an Inca temple who return home with an excavated mummy and soon begin to fall into a mysterious coma one after another. 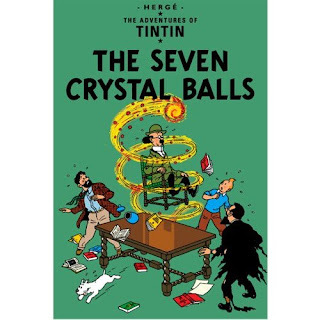 Tintin decides to investigate the cause with a little help from Professor Calculus and the legendary Captain Haddock, and before long the trail leads them to the jungles of South America. During this story Tintin is described as a famous reporter but perhaps my recollection doesn’t stretch far enough because I can only really recall him as an amateur sleuth, kind of like a younger, more adventurous version Poirot or Miss Marple - more prone to getting his hands dirty in exotic locations than sipping tea - and its exactly that role he takes on here. (Experts may be able to point me in the direction of an adventure where he does exhibit his journalism skills). Tintin himself is a slightly bland character, which perhaps means the reader can project their own thoughts and feelings onto him, allowing easier immersion into the story. He’s certainly outshone by the supporting cast from the amusing mishearings of Calculus, to the bumbling antics of the Thomson Twins, to the strangely human characteristics of Snowy. However, one particular individual beats them all for memorability: the constantly cursing, whiskey-drinking, accident prone, short-tempered Captain Archibald Haddock. The endless chaos Haddock causes is regularly the highpoint in any Tintin book, and that goes for both of these volumes – whether he’s crashing onto stage in the middle of an opera wrapped in a curtain with a cow’s head covering his bonce, causing an avalanche by sneezing, or slapping a llama round the face for biting his beard, his antics never fail to generate hilarity. What’s perhaps more surprising than the idea that he manages to come out of his multitude of scrapes relatively unscathed is the fact that Tintin rarely admonishes him for it and hardly even bats an eyelid most of the time. It could very well be because the Captain’s frequent pratfalls – usually accompanied by a cry of “Ten thousand thundering typhoons!” or something similar – often result in situations turning to Tintin’s favour. Haddock may end up flat on his back but the bad guys always come a cropper. Hergé’s art has become so familiar over the years that you may not register its genius because of its apparent simplicity. However, while you initially focus on things like the Tintin’s button nose and black dots for eyes, it soon it becomes evident just how complex and detailed the creator’s linework is. The backgrounds are brilliantly realised and the characters are wonderfully expressive and utterly believable in the context of the world the author has created.